Jordan Goddard in action during his first spell at Leamington. Paul Holleran is hoping Jordan Goddard can recapture the form he showed at the start of his first spell at Leamington after re-signing the midfielder from Halesowen Town. Goddard joined Brakes from Bristol Rovers in the 2014/15 season, scoring nine goals as the club slid out of the Conference North before joining AFC Telford. The midfielder found himself out of favour at New Bucks Head and was loaned out to Sutton Coldfield before moving to Yeltz where he made 21 appearances, scoring four times. Holleran believes Goddard has been unlucky with the way his career has progressed but says the 23-year-old has the right mentality to kick on again with Brakes. “The manager who signed him at Telford was gone after eight or nine games and he was out in the cold,” said Holleran. “He went to Sutton and he was very good at Sutton and was very close to going to Kidderminster. “He signed for Halesowen and did very well there so he’s been a tad unlucky. “We’ve seen glimpses of what he is capable of. “It will be a good thing for him to come into a football club and environment he enjoys. “I’m trying to make the 16 as strong and competitive as I can. “I’m aware Jordan is versatile and I’m aware what he can and can’t do. “When he was released from Bristol Rovers he started well for us but faded. “He’s now had another 18 months of non-league football and it shapes youngsters. “He’s been a little unlucky but kept at it. Goddard’s return to Leamington coincided with two departures this week as centre-back Dan Preston returned to parent club AFC Telford and winger Nathan Olukanmi joined Dunstable Town. Preston had been filling in for the injured Jamie Hood, while Olukanmi struggled to force his way into contention and Holleran said the two players were only going to be short-term options as Brakes struggled for numbers in the run-up to Christmas. “With Hoody and Pond out and Jack Edwards missing two games through suspension we were struggling to play Joe (Magunda) at the back. “But Jack’s back, Pondy’s okay so things have slightly changed. “We were hoping we would only need Dan for a month and he did well for us. “But in an ideal world you want players who are our players. “Similarly with Nathan. We brought him in when we were low on the ground and he showed what he can do in little flashes. “The position Nathan plays, Courtney Baker-Richardson is doing really well and Robbie (Thompson-Brown) and Ahmed (Obeng) play there. Brakes face the second of three consecutive home games tomorrow when they take on St Ives Town. 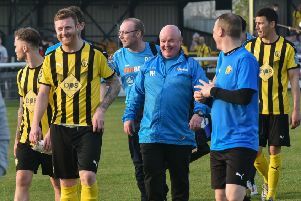 Leamington will be operating a ‘pay what you want’ promotion for the game and Holleran is anticipating a bumper crowd for the visit of the Saints who come into the match on the back of just one defeat in eight. “The club is a lways trying to do different things and hopefully people will support it,” said Holleran, who saw his side put in a much-improved performance to draw with promotion rivals Chippenham Town last Saturday. “St Ives are a good side and probably the form team in the league.